Tonight I watched this Douglas Sirk potboiler after a very long, well-earned hiatus. (The family was watching Australia versus New Zealand in the rugby union and) I spent the night in another room with unmitigated soap played to the hilt to the accompaniment of the melodramatic music of Frank Skinner. The film was made in 1956 and it seems to have preserved its appearance; no doubt somebody thought it was worthy of restoration. Most of the old tropes were there; oil baron's spoilt son Kyle (Robert Stack) has a drinking problem and, adding insult to injury, thinks he's infertile. Oil baron's daughter Marylee (a chronically lurching and ludicrously foxy Dorothy Malone) is in love with best friend Mitch, who really loves Lucy (Lauren Bacall) - Kyle's wife. Are you ready for this plot? Leaves were rustling, tyres were spinning, alcohol flowed freely, a man falls down stairs to his death, characters were staring menacingly at others from behind curtains, there was a shooting, jealousy in spades, Kyle lurching and laughing under the influence (in a menacing "I've got depression" kind of way!) and the ubiquitous black hired help looked on helplessly with an ominous "there's gonna be a killin' tonight". I laughed aloud when Marylee did a Douglas Sirk-equivalent 'dance of the seven veils' erotically in front of a picture of Rick (Rock Hudson) while some revolting trumpet jazz became increasingly shrill and loud on the portable record player. Meanwhile, downstairs, old man Hadley is at the end of his tether and his increasing desperation at his lawless and wanton daughter causes him to drop down dead at the top of the stairs, with full choreography. Close-up of a hand clutching a staircase railing and then..well, you know the rest. The production design was good, if claustrophobic, but I think Rock Hudson must have found it difficult to keep a straight face, hard on the heels of "Giant" the year before. The only similarity to that epic was the existence of oil rigs and very wealthy people who had 'problems'!! Plaudits to Bacall who tried to maintain her considerable class and dignity throughout, despite the fact that this script was a stinker. She would be rewarded for her perseverance the following year with a superb performance in Vincente Minnelli's classy "Designing Woman". I have to admit I have never seen this, but there are even more "abnormal" things in classic movies. I am stating this with some hesitation, but I am certain of it. In Rebel Without a Cause, James Dean is raped from the rear end as a punishment. I am not making this up, though the scene is often cut from modern broadcasts, and I defy anyone to confirm this by any online search, because I just happen to have caught a broadcast of it myself, at a time when most people would not have understood what was going on. Conversely, in the movie King and Country, the young Tom Courtney, a WW I soldier unjustly condemned to death, is allowed by his fellow soldiers to use them as if they were women as sort of his last meal. These things are only unbelievable to someone who has never been there. Nicholas Ray was a tremendously interesting and influential director!! 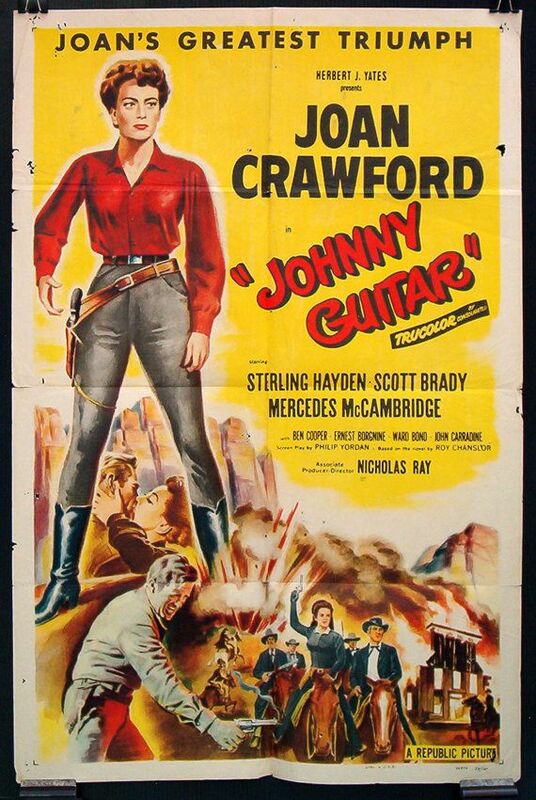 He ventured where others would not go in the 1950s; think of "Johnny Guitar" and its female protagonist (Crawford) and the sexual jealousy from the Mercedes McCambridge character. Daring for the times, and sometimes described as a 'western noir', the men played the lesser roles; the women were in the fight of their lives and the leading man (Sterling Hayden) the anvil on which this latent homosexuality is forged. Actually, the 1950s - in terms of mainstream film making - were not all the domestic idylls and silly picket-fence comedies sometimes described by cynics and which spawned the genre of domestic comedies on American television. Far from it; some incredibly interesting films were made. But assuredly there were some, like the Sirk film I've mentioned, which were risible attempts to create a mythology around wealth - sometimes oil wealth - and its consequential moral torpor!! It's great to be rich and the acquisition of wealth has always been fertile ground for storytellers, serious or funny. And, to give Douglas Sirk some credit, he made the excellent Technicolor noir "Leave Her to Heaven" and a partially successful, semi-serious exploration of race in the late 50s re-make of "Imitation of Life" which descended occasionally, like Lawrence Welk, into froth and bubbles.